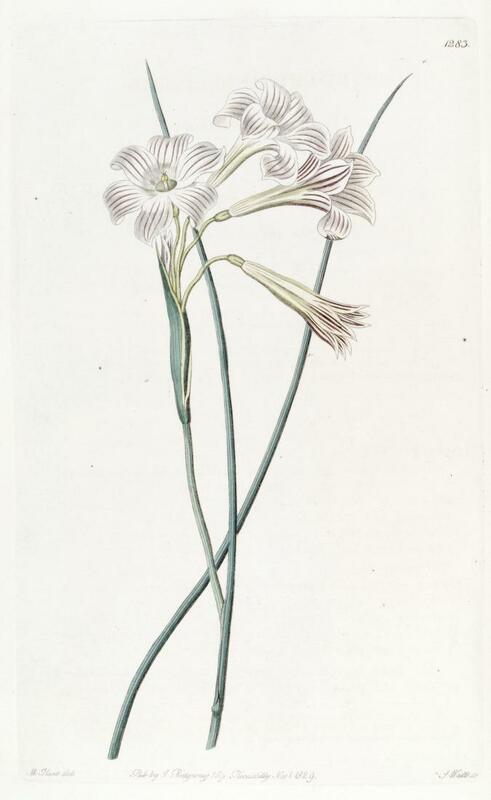 * Gladiolus biflorus Thunb., Gladiolus: 10 (1784). Solenomelus biflorus (Thunb.) Baker, J. Linn. Soc., Bot. 16: 121 (1877). Symphyostemon biflorus (Thunb.) Dusén, Ergebn. Schwed. Exp. Magell. 3(5): 203 (1900). Phaiophleps biflora (Thunb.) R.C.Foster, Contr. Gray Herb. 127: 43 (1939). Sisyrinchium narcissoides Cav., Diss. 6: 347 (1788). Galaxia narcissoides (Cav.) Willd., Sp. Pl., ed. 4, 3: 582 (1800). Sisyrinchium odoratissimum Lindl., Edwards's Bot. Reg. 15: t. 1283 (1829). Phaiophleps odoratissima (Lindl.) Raf., Fl. Tellur. 4: 29 (1836). Symphyostemon flexuosus Miers, Proc. Linn. Soc. London 1: 122 (1841). Symphyostemon odoratissimus (Lindl.) Miers, Proc. Linn. Soc. London 1: 122 (1841). Symphyostemon narcissoides (Cav.) Klatt, Linnaea 31: 569 (1862). Symphyostemon patagonicus Speg., Revista Fac. Agron. Univ. Nac. La Plata 3: 574 (1897). Phaiophleps patagonica (Speg.) R.C.Foster, Contr. Gray Herb. 127: 44 (1939).